Someone recently asked if I had taken the framed photo (below) on display as part of our collection of photo art. "Yes," I replied with some pride in my voice. She replied "You must have a really nice camera!" My jaw dropped! I was crestfallen. The camera didn't take the photo. I did! The photo was taken on simple equipment with advanced skills! A camera is just a box that holds recording media - film or a sensor. Lenses are more important. Quality glass and technical capabilities such as maximum aperture size allow a skilled photographer to create reality from their imagination. With this in mind we look at tips this month for buying lenses for your summer shooting season. 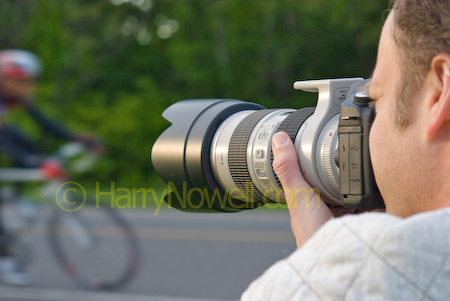 Zoom lenses allow you to get closer to the action without moving. They allow you to carry fewer lenses to cover the same range. Typically, though, they have small maximum apertures (like f4 or f5.6). This limits shooting in flash-less, low light conditions or where high speed shutters are needed. Fixed focal length or 'prime' lenses offer a single magnification. Their only zooming capability relies on your feet to get you closer or further away from the action. These lenses, though, are smaller, lighter and less obtrusive than zooms. They also offer far bigger apertures (like f1.4 or f1.8) allowing you to shoot in low light without flash. Choose zooms for covering events where flash is appropriate. Choose prime lenses for photojournalistic work and low light conditions. Rent lenses before buying to see which are right for you. When digital cameras first appeared on the scene sensors were expensive and camera manufacturers used small sensors to save money and make the new technology somewhat affordable. Manufacturers came out with a new line of lenses "optimized for digital cameras." Really, it meant the lenses were made to throw light only on to the smaller image circle of the small sensors and no further! These lenses will not work well with full frame sensors or 35mm film cameras. FX or full frame lenses are lenses that have been available for years - they are built to cover a traditional film frame or 'full frame' digital cameras. Don't invest in lenses optimized for small digital sensors! This includes avoiding Nikon's DX, Canon's EF-s and Sigma's DC lenses among others. Eventually most photographers will end up with a full frame digital camera. Lenses 'optimized' for small sensors will be obsolete or offer limited compatibility when full frame cameras are used. These lenses are fine EXCEPT they are not a good deal if you are ever considering a full frame camera. These lenses offer motion control in your lenses allowing you to overcome handheld camera shake at slower shutter speeds. The movie industry has used this technology for years to control camera shake. Stabilization has trickled down to still cameras. The technology is showing up in many consumer level lenses where people often shoot on automatic exposure modes that select slow shutter speeds automatically. VR and IS lenses are also offered as options on higher end lenses. For instance, Nikon offers the 80-200 f2.8 non VR lens ($1150) and the 70-200mm f2.8 VR lens ($2120). The lenses differ more than just the VR feature but notice the price difference! I have never bought a VR lens. When there has been a choice I have bought the non-VR lens and used my tripod to reduce vibration. For me, the cost for VR is too high for the limited bonus. It seems manufacturers are making VR standard features on many of their lenses. VR is a decent feature but has limited benefits. I cannot justify the price! I was at Vistek this week buying some supplies and asked Vincent some technical lens questions to make sure I had my facts straight. He referred me to their lens buying guide and their brand specific guide for more information. Also check DPreview.com for reviews on specific equipment. Your homework? Do some research. Make informed decisions when buying lenses. I started buying equipment almost twenty years ago and I still use some of this original equipment. With the right information you can purchase lenses that will give you many years of use. I often get asked "what equipment do you use?" I usually respond "It doesn't matter." Canon, Nikon, Pentax, Sony etc all make excellent equipment. How you use the cameras is far more important than what brand of equipment you use. Lenses are more important than the camera body and different photographers choose different arsenals of lenses depending on what they shoot. I shoot corporate and family portraits, events, weddings, sports, editorial work, stock and artwork... often with a candid, motion influenced style. There's not much else I need. I will likely upgrade to an 85mm f1.4 this year and can foresee getting a 105mm macro lens sometime. Don't sweat the equipment. Make what you have work for you.